The Obama administration deserves credit for the successes produced so far by its “pivot to Asia”, from the encouragement of political reform in Myanmar, to the creation of a permanent Marines base in Australia, to the initiation of joint military exercises with the Philippines. After a decade in which the Bush administration mostly ignored the Pacific, failing even to send high-level officials to some regional meetings, the Obama administration was right to focus military and diplomatic attention on countries neighboring China, a potential great power adversary. The enthusiasm in Washington for the “pivot” has gone much too far, however. It’s true that Southeast Asian nations like Myanmar, Vietnam, the Philippines, and Malaysia, are eager for closer cooperation with the United States to counter China’s perceived rise. But the Obama administration has been so eager to reciprocate that its has failed to give those countries’ governments, and especially their militaries, the scrutiny they deserve. Some of the countries that Washington has been dealing with as part of its outreach don't merit any suspicion. Australia has a long democratic tradition, and the Philippines, Singapore, and Malaysia are all “flawed” democracies by the standards of Freedom House and the Economist Intelligence Unit. Vietnam, though not a democracy, has a well-disciplined military that does not, by and large, commit massive abuses against its own population. But the Obama administration has also engaged with much seamier political actors, including regimes in Cambodia, Thailand, Myanmar, and Laos, where the military has often dominated politics. In some sense, engagement with unsavory governments was unavoidable as part of the “pivot”: Washington doesn’t choose the countries that surround China. But it’s not just grand strategy motivating this engagement; some of the administration’s decisions in making its headlong rush to Asia aren’t justified by cold strategic calculus. Rather, there seems to be a strong belief among some administration officials that the U.S. military has vast untapped power as a diplomatic actor. Indeed, a lot is now riding on the Pentagon’s ability to change the habits and culture of its foreign counterparts, and thus to make them more reliable long-term allies. Washington will soon establish military-to-military ties with Myanmar, whose armed forces contain battalions accused of some of the worst crimes against humanity on record. In Cambodia, the administration has started conducted small-scale joint exercises and providing training to Cambodian forces from U.S. Special Forces. The U.S. has also started exchanging defense attaches with Laos—one of the world's most closed societies—for the first time in thirty years, and has started to provide some military education programs for Lao soldiers. And in Thailand, the U.S. is conducting massive joint exercises, and working toward joint command operations. But there is little reason to believe that these militaries will cease their abuses of human rights, or that they would support broader U.S. interests over what's required to keep themselves firmly entrenched in power. For the Cambodian government, which has a history of assassinating domestic opponents, the recent trend lines are all downward: Over the past five years, according to Human Rights Watch, Amnesty International, Freedom House, and the State Department’s own human rights reports, the human rights situation in Cambodia has deteriorated, with increasing threats to and murders of activists, journalists, and other government opponents. This has continued even as the U.S. military has paid for the sons of the country’s ruler, Hun Sen, to attend West Point, according to a report in the Washington Post. In Myanmar, it's true that the government has, since 2010, undertaken dramatic reforms that have seen Aung San Suu Kyi leave house arrest and join Parliament, and space open up dramatically for civil society, opposition politics, and free media. 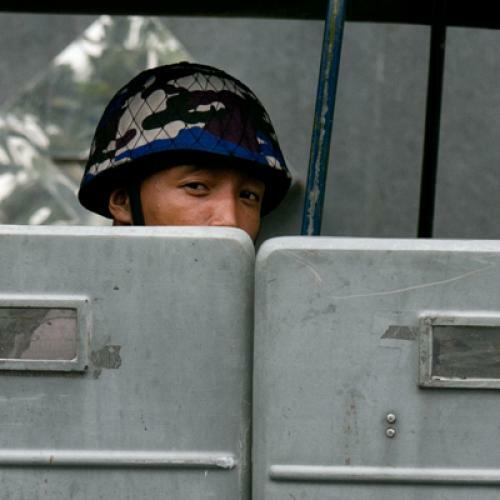 Yet the Myanmar military remains highly repressive and it is hard to tell whether it is even under the control of the civilian president, Thein Sein. Several human rights groups, including Human Rights Watch, have noted that Myanmar’s security forces have helped to instigate, or turned a blind eye to, violence between Buddhists and Muslims in Arakan State, resulting in 90,000 people forced from their homes and at least 200 killed in the past six months. Meanwhile, the military has ramped up a brutal war against an ethnic militia called the Kachin Independence Army over the past year. The Myanmar military has been accused by local monitoring groups and international human rights groups of using forced labor, summary executions, and wanton shelling in its campaign in Kachin State. Thailand and Laos are little better. Though Laos is one of the most closed countries in the world, thus making it hard to come upon reliable statistics, activists who have dared stand up to the repressive Lao military regime have been known to simply vanish. And in Thailand, which has had 18 coups or attempted coups in its modern history, the security forces only two years ago gunned down at least 80 civilian protesters in the streets of Bangkok, not hesitating to transform the Thai capital into a smoking ruin of a free-fire zone. At the same time, in the deep south of Thailand, where a separatist insurgency rages, the military has been accused of disappearances, torture, and summary executions. Whatever the Pentagon’s ability to transform these regimes, it’s worth noting that they do not even provide the strategic benefits to the U.S. that would justify such cooperation. Some U.S. officials warn that, without closer American engagement, Cambodia might be “lost” to China, which already is Phnom Penh’s biggest donor and investor, giving Cambodia some $500 million in soft loans two months ago. Laos could also plausibly tilt towards China, which provides extensive training for Lao soldiers, and is probably now Laos’ biggest donor (though no one knows for sure). But even if Cambodia and Laos tilted heavily toward China, would that be a serious blow to America’s presence in Asia? Not as long as the United States has strong ties to the more democratic countries in the region; the efficacy of the pivot doesn't depend on its unanimity in the region. Myanmar is a larger and more strategically located country. But Myanmar is unlikely to tilt toward China even if the administration had gone extremely slow in re-establishing military ties; the Myanmar generals began to engage with the West in 2010 in large part to reduce their dependence on China, which had become the dominant strategic, economic, and diplomatic force in Myanmar. Nearly every Myanmar official I have spoken with says that the Myanmar government, seeking to balance against China, is desperate for all types of Western aid, investment, and relationships. So it is unlikely that, if the Obama administration had held off military ties until the Myanmar military was more clearly under civilian control, and had purged its worst offenders, the Myanmar government suddenly would have cut off its engagement with the West. Thailand is another important strategic actor; but it, too, would be unlikely to downgrade ties with the U.S. if the White House were to take a harder line toward its military. The current government of Prime Minister Yingluck Shinawatra has no love for the Thai armed forces as they forcibly removed Yingluck’s brother from power in a coup just six years ago. It's likely that the civilian government in Thailand would support the U.S. government if it chose to curtail, rather than bolster, its support to the Thai military. But it seems the White House would prefer to test its theory about the Pentagon’s ability to serve as a leading diplomatic actor. That’s good news for the militaries we’re “pivoting” towards; less so for the political opposition in those countries. What remains to be seen, of course, is what it will mean for America’s long-term interests in the region.